OEA Legislative Watch is the association’s newsletter covering the legislation and policies that affect public education employees. OEA Vice President Scott DiMauro testified before House Finance Subcommittee on Primary & Secondary Education on Tuesday to present OEA’s views on school funding, academic distress commissions, and proposed policy changes regarding charter schools that have been offered by the Governor. The hearing was part of the deliberations on House Bill 166 that contains Governor DeWine’s budget proposals. You can read more about our positions in OEA’s testimony that was given before the subcommittee. This week, Representatives Bob Cupp (R-Lima) and John Patterson (D-Ashtabula) released the Fair School Funding Plan that would provide an additional $400 million in FY 2020 for local public school districts. The plan represents more than 15 months of work by legislators, local school leaders, and education finance experts to craft meaningful alternatives to the current way in which Ohio funds its schools. Under the plan, no school district would receive less funding than in FY 2019. OEA believes Ohio’s current school funding formula is a patchwork of band aids that fails to provide adequate funding. It is not functional nor is it driven by what constitutes a high-quality education. This is evidenced by the fact that currently over 500 — or 80% — of Ohio’s school districts do not directly receive funding as calculated by the formula and are instead on a gain cap or funding guarantee. The Fair School Funding Plan seeks to base decision-making on identifiable student needs and what it actually costs to provide a high-quality education. Those who crafted the plan believe it is fair, transparent, and easily understood. The proposal will end the use of gain caps and lessen the number of districts that rely on a funding guarantee. Under the plan, no school district would receive less funding than in FY 2019. The projected phase-in of the plan is four years. Two former teachers now serving in the Ohio House of Representatives – Joe Miller (D-Amherst) and Don Jones (R-Freeport) – have introduced bi-partisan legislation that would repeal the disastrous law that allows the state to takeover local school districts that are deemed to be in trouble. HB 154, which has 29 bi-partisan co-sponsors, would restore local control to school districts. A strong push by OEA to get HB 154 introduced with broad bi-partisan support means this repeal bill is well-positioned to be approved by the Ohio House of Representatives. 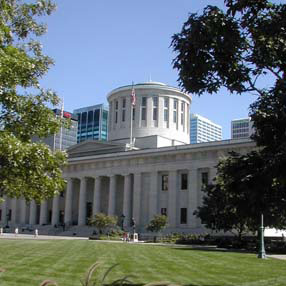 OEA members will be advocating for passage of HB 154 at the OEA Lobby Day in Columbus on April 9. 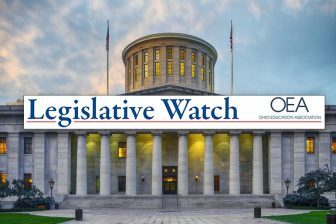 Reps. Joe Miller (D) and Don Jones (R) will urge their colleagues to repeal the failed state takeover law when they deliver bill sponsor testimony in the Ohio House Education Committee on April 2. Rep. Joe Miller represents Lorain City Schools, one of the three districts already taken over by the state (the other two are Youngstown and East Cleveland). By repealing the state takeover law, the Miller/Jones bill would dissolve all existing Academic Distress Commissions and appointed CEOs. Local control would be returned to elected school boards. The collective bargaining restrictions in the state takeover law would be repealed. State takeovers of local school districts are hurting students and the communities in which they live. When state officials and appointed managers are running local school districts, it lowers student and educator morale, undermines local engagement, and impedes progress. State takeovers are based on misleading state report cards and excessive testing that severely penalize students in poverty. Instead of harmful state takeovers, HB 154 will require F-rated school buildings to develop school improvement plans that are locally designed and locally implemented. No more Academic Distress Commissions. No more CEOs. No more state takeovers. Two former teachers now serving in the Ohio House of Representatives — Joe Miller (D-Amherst) and Don Jones (R-Freeport) — have introduced bi-partisan legislation that would repeal the disastrous law that allows the state to takeover local school districts that are deemed to be in trouble. HB 154, which has 29 bi-partisan co-sponsors, would restore local control to school districts. OEA strongly supports the bill. State takeovers of local school districts are hurting students and the communities in which they live. The Miller/Jones bill would also dissolve all existing Academic Distress Commissions and appointed CEOs. Rep. Joe Miller represents Lorain City Schools, one of the three districts already taken over by the state (the other two are Youngstown and East Cleveland). It is time to restore local control to elected school boards and superintendents that are accountable to the community. It is time to return collective bargaining rights and professional respect to the classroom teachers who understand the unique needs and challenges of their students. On Friday, March 15, 2019, Governor DeWine released his Executive Budget detailing his spending plans for Fiscal Years (FY) 2020 and 2021. Below is a review of the governor’s proposals. Please note that there is little detail at this point as the actual budget language has yet to be released. We expect that the language in the form of a bill will be introduced later this week. OEA Government Relations staff will share additional information as it becomes available. The governor’s proposed budget provides $550 million over the biennium to support at-risk students by providing wraparound services, mental health counseling, mentoring, and other means of addressing student needs. School districts will be encouraged to partner with local nonprofit service providers such as educational service centers, county mental health, addiction and job and family services’ agencies to provide the services. Under the proposal, school districts will not see an automatic increase in general aid and are guaranteed to receive at least what they did this fiscal year. According to the administration, every district would be guaranteed a minimum of $25,000 in FY 2020 and $30,000 in FY 2021 from the new fund. Additional money would be distributed based on a district’s percentage of students in poverty. These amounts will range from $20 to $250 in FY 2020 and $25 to $300 in FY 2021. Click this link to view the Student Wellness and Success Funding report, with district-by-district simulations. It is important to recognize that these figures are not final and will likely change during the budget process. The proposal does not define what requirements are needed to earn that designation. The Ohio Department of Education will also receive an increase in funding for charter school oversight from $2.5 million in FY 2019 to $7 million in both FY 2020 and FY 2021. The proposal also increases the appropriation for the income-based EdChoice Voucher expansion from 47.7 million in FY 2019 to $57.2 million in FY 2020 and $71 million in FY 2021 in order to fund the addition of grades 6 and 7 to the program which was passed during the Kasich administration. The proposal freezes ODE line items for school transportation funding, early childhood education and adult education at FY 2019 levels in both years of the biennium. The proposal allocates $20 million for drug abuse prevention curriculum for Ohio’s children, including $2 million for educational service centers to provide professional development to teachers on drug abuse prevention education. The budget provides an additional $60 million in federal funding to nutrition programs such as school lunch and breakfast programs. The proposal continues the performance-based funding formula and provides for a 1.1% increase in funding in FY 2020 over FY 2019 levels and a 1% increase in FY 2021 over FY 2020 levels. The proposal increases funding for the Ohio College Opportunity Grants that is projected to increase student awards by $400 in FY 2020 and $500 in FY 2021. The proposal provides for a $24 million increase in funding over the biennium for the Choose Ohio First Scholarship. Ohio students who are majoring in the fields of Science, Technology, Engineering, Mathematics, STEM Education and Medicine may qualify for the scholarship. The budget maintains funding for these supplements at FY 2019 levels in both FY 2020 and FY 2021. The budget projects that state General Revenue Funding for FY 2020 will be $717.4 million (5.5% increase from FY 2019) and $719.1 million in FY 2021 (0.2% increase from FY 2020). Beginning in FY 2020, the budget proposal consolidates line items. The County Board Subsidies line item that provided funding to county boards to assist with the cost of services and administration and the County Board Case Management line item that provided direct support to county boards for case management services are now appropriated in the Medicaid Services line item. The Medicaid Services line item is increases by 11.9% in FY 2020 over FY 2019 levels. The proposal indicates that the increase in the Medicaid Services appropriation is not just as a result of the consolidation. The budget provides for a $2.7 million appropriation in each year of the biennium to support the Employment First Initiative. Below are notable line items, as proposed by the Governor, for state agencies employing SCOPE members. The FY 2020 percentage change is based on FY 2019 figures; the FY 2021 percentage change is based on FY 2020 figures. The available budget information does not reveal major policy changes impacting SCOPE members in these state agencies. The Ohio House and Senate have approved a bill (HB 491) to extend the alternative graduation pathways to the classes of 2019 and 2020. The bill passed the Senate by a vote of 29-0 and the House concurred by a vote of 78-1. Under current law, in addition to successfully completing required coursework, students are required to meet one of three graduation “pathways” each of which is dependent on the results of high-stakes testing. OEA strongly supports the extension of the alternative pathways and applauds this action. For the class of 2018, the legislature provided alternative graduation pathways that would provide students with additional options such as completion of a capstone project, work experience, and grade-point average. The Ohio Department of Education estimated that 33,000 seniors were at risk of not graduating without action to extend the alternative graduation pathways. HB 491 extends the alternative pathways to the class of 2019 with no changes. There are some adjustments for the Class of 2020 which include: a cumulative grade-point average of 2.5 for courses completed during the junior and senior year; the capstone project must comply with guidance developed by ODE and each project should be designed as a culmination of the student’s high school experience; the work or community service shall comply with guidance from ODE on school approval and verification of the work. ODE guidance for the Class of 2020 must be completed by May 31, 2019. The bill still needs to be signed by Governor Kasich. On Thursday, December 6, 2018, the Senate unanimously passed House Bill 572 by a vote of 29-0. The bill addresses the issue of service credit for non-teaching employees of County Boards of Developmental Disabilities who work on a school calendar rather than year-round. Recent OPERS action had reduced service credit for these employees and the bill would restore a full-year service credit. The bill is jointly sponsored by Representatives Gary Scherer (R-Circleville) and Stephanie Howse (D- Cleveland). OEA strongly supports this bill as this legislation is desperately needed to address this issue for these public employees. OEA testified in support of the bill and several OEA members also submitted written testimony advocating for its passage. Perform full-time service for at least nine months of the year and paid earnable salary in each month of that year. Language in the bill specifies that this applies the dating back to January 1, 2017. Because the bill was amended in the Senate, the House will have to vote to agree with Senate amendments. That vote is expected next week and then HB 572 will head to Governor Kasich to be signed into law. House Joint Resolution 19 is a proposed Constitutional amendment that would make it more difficult to pass amendments to the Ohio Constitution through the initiative process. The proposal was met with sharp criticism as an attack on direct democracy. OEA joined more than 90 groups that voiced opposition to the plan and the efforts to rush it through a lame duck session. The resolution has received four hearings in the House Government Accountability and Oversight Committee but has not been voted out. HJR 19 proposes changes to the process for passing an initiated constitutional amendment and for a proposed statute. Specifically, for an initiated constitutional amendment, it would increase the percentage required for voters to approve an amendment to 60%, specify that signatures on a petition are valid for 180 days and set a submission deadline of April 1. For initiated statute proposals, HJR 19 would modify the signature requirement to 5% of electors based on the most recent vote for Governor while removing the requirement for a supplemental petition to be filed in order to place an initiated statute on the ballot if the General Assembly amends the statute or does not act. Further, HJR 19 would prohibit the General Assembly from amending or repealing an initiated statute for one year. To be enacted, HJR 19 would need to clear both chambers by a three-fifths majority and then be approved by voters as a constitutional amendment. It does not appear that the legislature will move this proposal in the lame duck session. However, this is likely to be an ongoing issue next session. The Ohio Senate last month passed HB 21, sponsored by Rep. Steve Hambley (R-Brunswick), by a vote of 32-0. The measure, which is strongly supported by OEA, was approved last December by the Ohio House, 94-0. The governor is expected to sign the bill. It helps protect school districts from erroneous charter school deductions. Charter schools and the Ohio Department of Education (ODE) will take more responsibility for verifying the school district in which a charter student lives. School districts would continue to have the ability to review and challenge charter school student residency claims. It seeks to solve problems with the Education Management Information System (EMIS) by requiring ODE to establish an EMIS advisory council. The council shall make recommendations to the superintendent of public instruction to improve the operation of EMIS and shall provide a forum for communication and collaboration between ODE and parties affected by the collection, reporting, and use of the system’s data. Members of the council shall include department staff and representatives of school districts and other entities that regularly interact with EMIS.